No safe level of exposure to organophosphate pesticides exists, says a recent comprehensive study of all existing scientific literature on the subject. The writers contend the entire family of pesticides known as organophosphates must be phased out because they cause brain damage in children, even at low levels of exposure. For decades, organophosphates have comprised the main ingredient in pesticides used by many farmers. Babies born to women exposed to organophosphates suffer a range of disorders including impaired mental and motor skills, memory loss, autism, and attention-deficit hyperactivity disorder. Were you or a loved one exposed to toxic chemicals? Get a free evaluation of your case. Contact the birth defect attorneys at Waters Kraus & Paul at 800.226.9880. A member of the organophosphate family, the pesticide chlorpyrifos, caused dangerous side effects for dozens of farm workers on a cabbage farm in California in 2017. Particularly troubling, the pesticide they were exposed to came from a different field. This phenomenon, pesticide drift, occurs when pesticides sprayed over one field are carried by wind elsewhere. This population of unintended victims could include anyone — from children and pregnant women to the elderly. Although chlorpyrifos has been banned from residential use since 2000, it can still be used in agriculture. After instituting the residential ban, the Environmental Protection Agency began taking steps toward making chlorpyrifos illegal across the board. 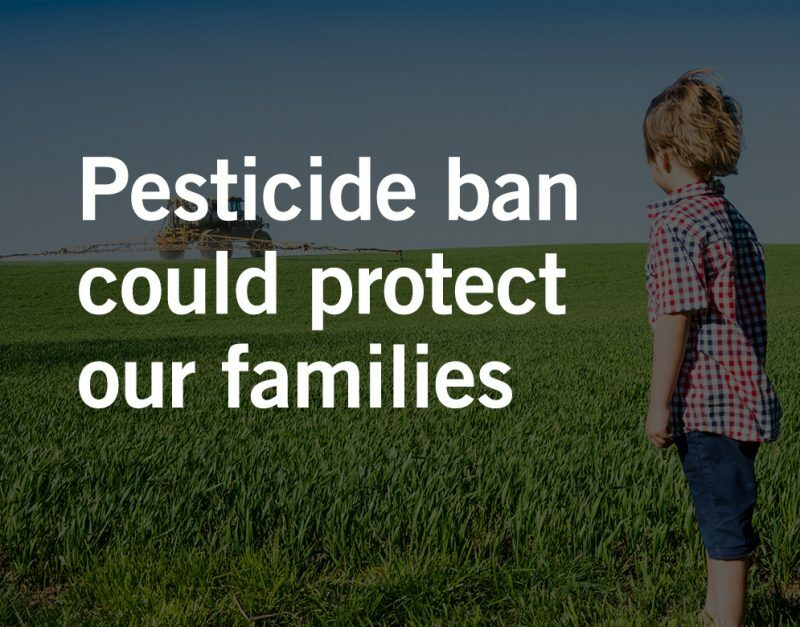 That ended in 2017 after the Trump administration’s EPA head Scott Pruitt met with a pesticide manufacturer and then dismissed scientific evidence linking the pesticide to harmful effects in farm workers and their unborn babies. It is no wonder that the American Academy of Pediatrics and the Environmental Working Group said that the reversal of the ban on chlorpyrifos “puts all children at risk.” The pesticides are frequently used on golf courses, schoolyards, around shopping malls, and other public spaces. This widespread use along with pesticide drift led to pervasive exposure. Irva Hertz-Picciotto, a co-author of the report and an environmental epidemiologist at the University of California, Davis, says the study is “calling for really moving toward a ban on both agricultural and nonagricultural uses.” Yet many other synthetic pesticides are unsafe as well. Alternatives to organophosphates such as pyrethroids and neonicotinoids come with similarly dangerous risks, like developmental issues in children and toxicity to invertebrates. The danger in these chemical pesticides is widely known, but farm-owners continue to use them at the risk of the health of farm workers and those who live and work nearby. Likewise, some government officials are putting the American corporations who lobby for their use over the safety of the American family. Have You Been Exposed to Pesticides? If you have a child with birth defects caused by exposure to chemicals in the workplace, and you worked on a farm, contact the birth defect attorneys at Waters Kraus & Paul at 800.226.9880. We have been representing families who have suffered as a result of toxic exposure for over twenty years. Contact us to learn how our birth defect lawyers can help you fight companies who refuse to discontinue the use of pesticides known to be harmful to children.